With this graph, you can place SharePoint data on Google maps. The following sections explains the configuration settings. To place data on Google maps, there are two ways data can be geo located. Google maps can turn an address or a location name into map locations (this process is called geo coding), when using geo coding, you must have a SharePoint column that contains full address or location name. When using this location code, make sure you have full, specific address or location names, to give Google maps maximum change to the the correct geo location. 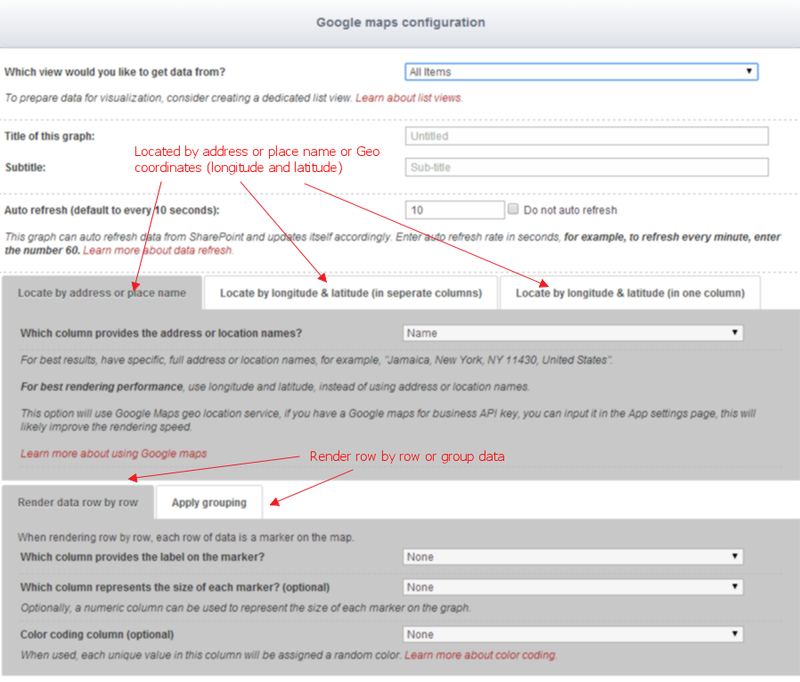 When using geo coding, Google maps imposes usage limits, you can read more about it here from Google’s documentation. So this location mode is best suited for small datasets. You can also using geo coordinates (longitude and latitude), when using this mode, Google maps does not have to geo code the data, since the longitude and latitude are already provided. This mode renders much faster than the above geo coding method.